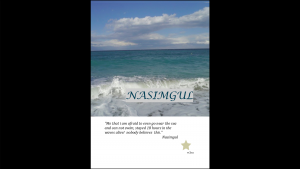 Nasimgul spent 18 hours in the rough sea near Lesvos without knowing if she’d survive and having lost track of her small baby girl in August 2014. This is her story. 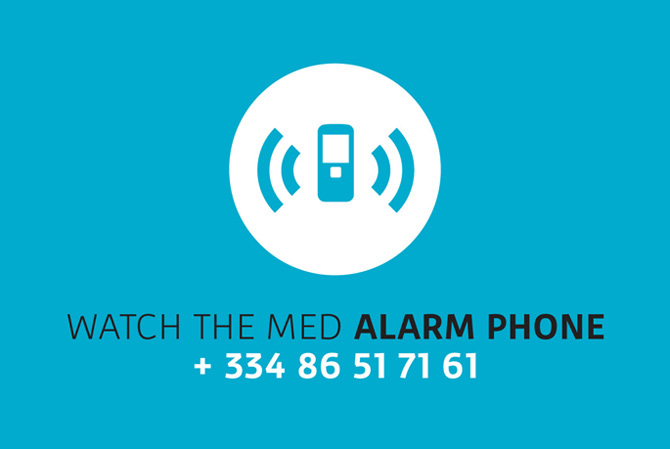 We received the information that there is a rescue operation in Nees Kydonies Lesvou. A 38-year-old woman has gone missing. Strong winds in the area. The coast guard boats are not sailing only a helicopter flies for a while over the area. 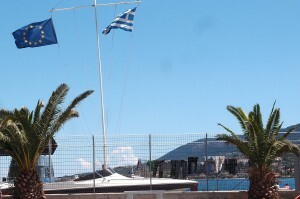 When I started telling the people my own story, that I came here via Greece and have been very long here and than made it out – it changed our relation immediately. I had all the memories from the past – it was exactly this harbour and it was exactly this place of my arrival. But the difference was: when I arrived here, nobody was there to explain anything to me or to say welcome. We are now here in Mitilini on our second journey back to the border. 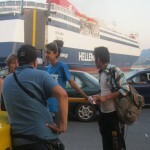 In a group of activists from various countries – with many of us having arrived in Europe via the Greek islands – we decided to go daily to the harbour to meet with people who were released from the refugee-prison in Moria and sought to leave for Athens. On the first day we met 24 people, all of them Afghan refugees. 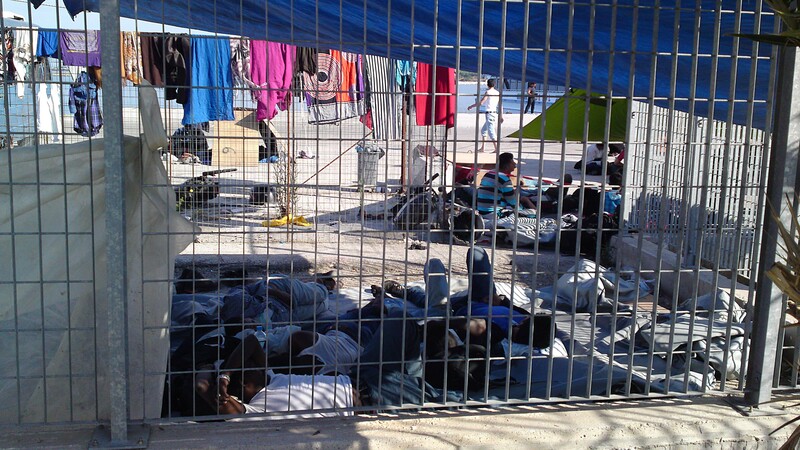 After their arrival on the island by boat they were imprisoned in Moria. 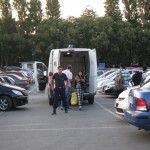 From there they were transferred directly by a police-van to the harbour. Most of them had been imprisoned for about one and a half weeks – and all of them were quite happy to be able to continue their trip. 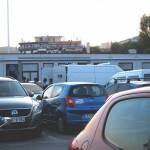 These days there are daily releases from the prison as there are daily arrivals too and people try to continue their trip with the ferries going to Athens. Upon release they receive a white paper (deportation order) that says that they have to leave the country within 30-days. When the 30 days are over they become undocumented again and fear imprisonment again only for this reason up to 18 months and more. Pashtu and her four children arrived this summer in Lesvos, Greece. Even though the finally succeeded in reaching Europe they had to encounter a great loss: their daddy! He is one of many refugees who have been arrested and charged for alleged human smuggling while their only fault has been to escape war and death while lacking any legal ways to save their lives but also lacking sufficient financial means to take the unofficial and dangerous paths. The family nowadays lives in PIKPA and awaits the trial of the father. They need all available support. This booklet was created in solidarity and together with the family and with the aim to collect money for the lawyer of the father. Please help with your donations. Despite the positive experience of PIKPA open welcome centre that was opened by the end of last year by the local activist network “Village of all together”, which provided for the first time a real reception solution for refugees, the authorities on Lesvos keep refugees locked up in degrading and inhuman conditions ignoring the given alternative. 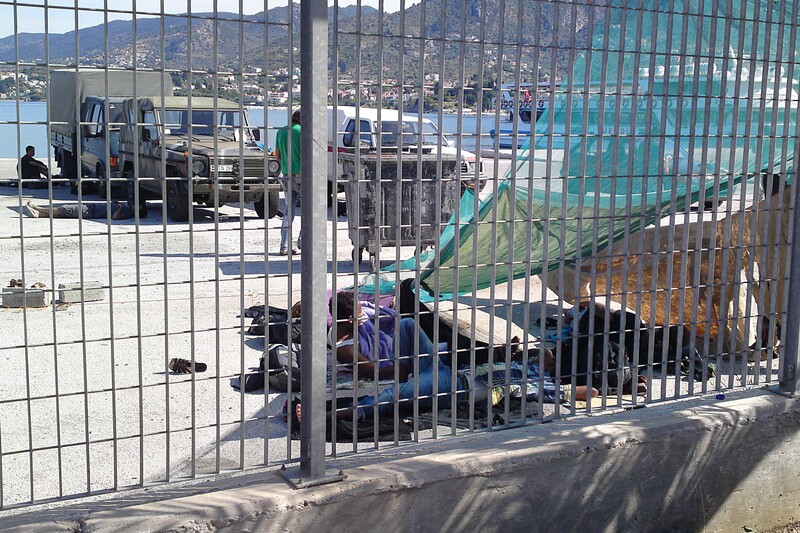 With the increase in arrivals in the beginning of May 2013, detention facilities started to get overcrowded once more on the island. The authorities didn’t know where to put the refugees anymore. 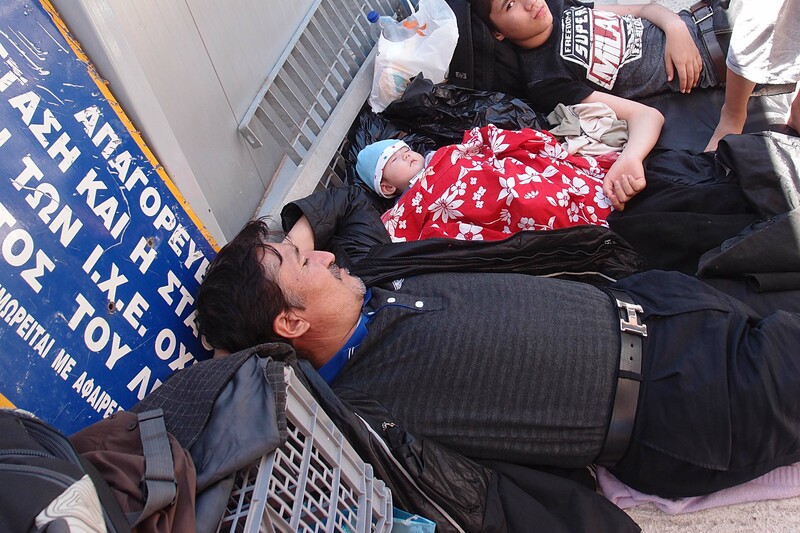 Some of the recent arriving refugees are trying to survive since three days in the sun while being “locked up” in the port of Lesvos without any protection or infrastructure. There is no food supply by the responsible authorities but only through volunteer citizens on the island. Nevertheless it remains insufficient. Yesterday one young man fainted due to heat, thirst and hunger. Among the refugees of the last three days, who come in their majority from war torn areas such as Afghanistan, Syria and Somalia, are several pregnant women, elderly and sick persons, small children and even a five-mmonth-old baby with severe health issues. Basic medical aid is provided by the Doctors of the World. 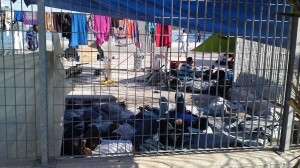 The coast guard and the police keep even vulnerable persons such as families, children, pregnant women for days imprisoned. Additionally Syrian nationals who according to a decision of the Ministry of Citizen Protection are not to be imprisoned anymore remain at least some days behind the bars. On Lesvos since two months the coast guard arrests the refugees on land and on sea, detains them for a few days in the fenced open area inside the port, makes a first registration and then transfers them either to the local police station or to a detention camp in Chios or elsewhere in Greece. The police then issues after an uncertain period of time between some hours and up to months a detention and a deportation decision against each refugee. Not knowing where to put the refugees other than inside the fenced port area or in the filthy cells of the police station, the arriving refugees are pushed around from one detention place to the other, from one island to the other or even to the mainland. Currently the detention centre of Chios where many of the in Lesvos arrested had been transferred to has also passed its capacity (of 100). No one can tell who will stay for how much time in detention. 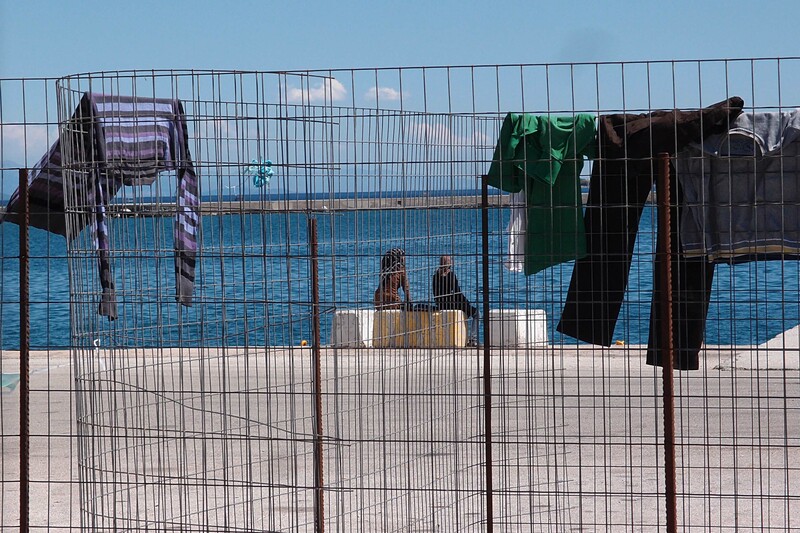 At the same time there are unaccompanied minors imprisoned in different police stations of the island who will soon reach one month behind the bars because they wait for a place in a specialised reception centre. Such a place exists in Agiasos, a mountain village on the island, but instead of offering refuge to the children in prison, the government has cut the funding, the centre is since two months without staff and the 60 hosted minors are trying to survive now without any food. and as such to asylum in Europe. Even more, the alleged push-backs put the lives of the refugees in risk of death. 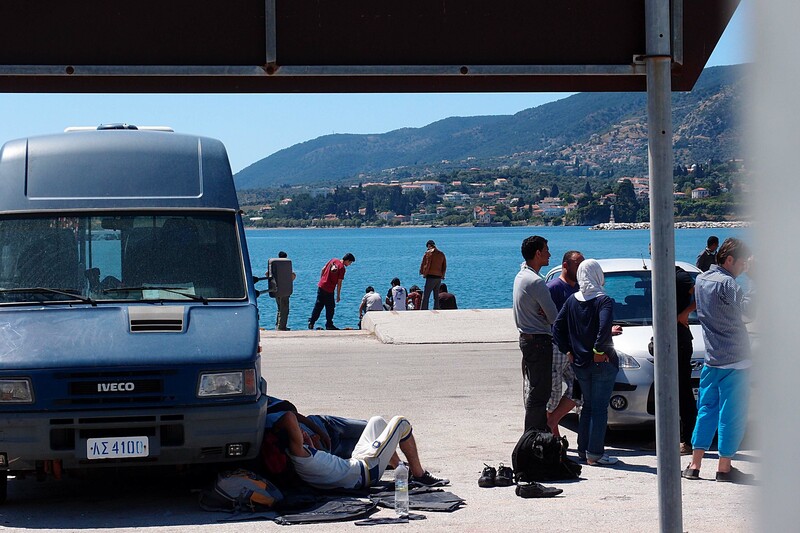 Despite the great efforts of the local activists in welcoming the new arriving refugees with all possible means in PIKPA and outside of it, the government obviously has not the intention to invest in this project and to create hospital and open welcoming centres. On the contrary it is creating a constantly growing detention and deportation regime with new and bigger prisons, growing repression, higher fences and hidden deportations on the border. Everyone asks: When will we be free? P.S. 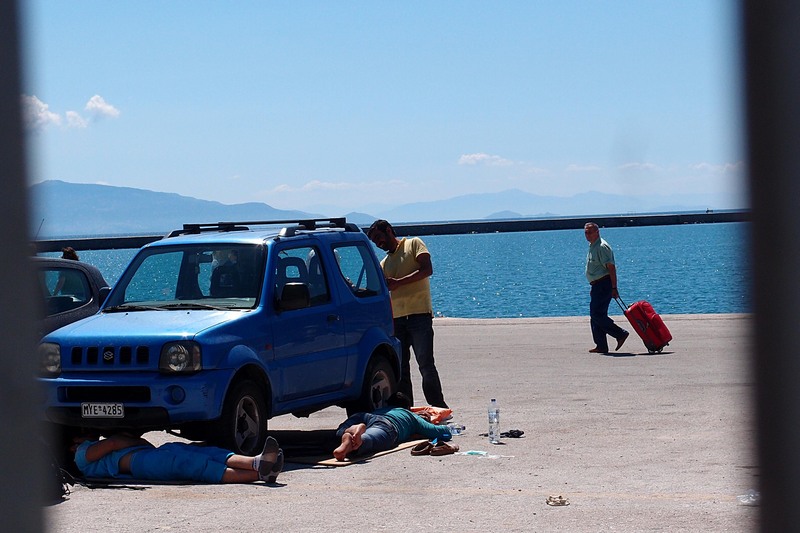 A remark towards the Frontex boat and staff that is currently in operation on Lesvos: How exactly is Frontex with its fundamental rights approach reacting to the obvious degrading detention conditions and the alleged push-backs? As proudly presented the high technology and expertise assumingly allows the “experts” from the European Agency to see everything that is going on on the border. Doesn’t it? IF not actively part of the system isn’t there at least a responsibility of cognisance and thus a complicity?